PETALUMA, Calif—(February 5, 2018)— Sonoma Pharmaceuticals, Inc. (NASDAQ: SNOA, warrants SNOAW), today announced the introduction of MicrocynVS®, a family of animal healthcare products developed exclusively for the U.S. veterinarian market. MicrocynVS family of products include: Wound & Skin Care Spray, Ophthalmic Gel, Eye & Ear Wash and Hot Spot/Anti-Itch Gel Spray with Dimethicone. All the products are well suited for dogs, cats, birds, horses, goats, reptiles and others. These products are based upon the clinically proven Micrcocyn® Technology with 53 patents, 30-plus clinical studies and 15 FDA clearances. This hypochlorous acid technology has successfully treated over ten million patients worldwide. The family of MicrocynVS products are being displayed in the Sonoma booth #2734 at the VMX Expo in Orlando, Florida on February 4-7, 2018. 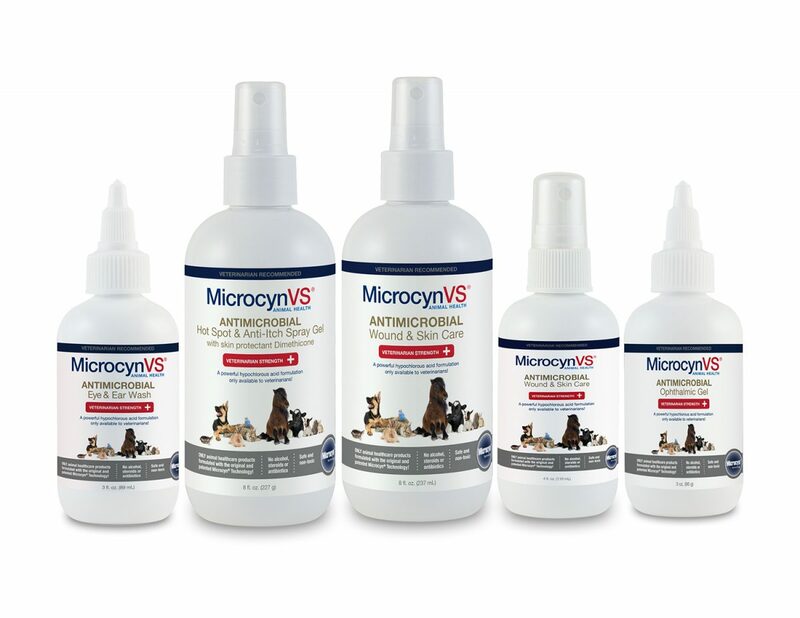 Veterinarians interested in the MicrocynVS products can order via First Vet Supply (VMX booth #3200) at 1-800-998-4661 or email sales@firstveterinarysupply.com. More information is also available at www.microcynvs.com. Sonoma is a specialty pharmaceutical company that develops and markets unique and effective solutions for the treatment of dermatological conditions and advanced tissue care. The company’s products, which are sold throughout the United States and internationally, have improved outcomes for more than five million patients globally by reducing infections, itch, pain, scarring and harmful inflammatory responses. The company’s headquarters are in Petaluma, California, with manufacturing operations in the United States and Latin America. European marketing and sales are headquartered in Roermond, Netherlands. More information can be found at www.sonomapharma.com. Except for historical information herein, matters set forth in this press release are forward-looking within the meaning of the “safe harbor” provisions of the Private Securities Litigation Reform Act of 1995, including statements about the commercial and technology progress and future financial performance of Sonoma Pharmaceuticals, Inc. and its subsidiaries (the “Company”). These forward-looking statements are identified by the use of words such as “believe,” “achieve,” and “strive,” among others. Forward-looking statements in this press release are subject to certain risks and uncertainties inherent in the Company’s business that could cause actual results to vary, including such risks that regulatory clinical and guideline developments may change, scientific data may not be sufficient to meet regulatory standards or receipt of required regulatory clearances or approvals, clinical results may not be replicated in actual patient settings, protection offered by the Company’s patents and patent applications may be challenged, invalidated or circumvented by its competitors, the available market for the Company’s products will not be as large as expected, the Company’s products will not be able to penetrate one or more targeted markets, revenues will not be sufficient to fund further development and clinical studies, the Company may not meet its future capital needs, as well as uncertainties relative to varying product formulations and a multitude of diverse regulatory and marketing requirements in different countries and municipalities, and other risks detailed from time to time in the Company’s filings with the Securities and Exchange Commission including its annual report on Form 10-K. The Company disclaims any obligation to update these forward-looking statements, except as required by law. Sonoma Pharmaceuticals®, Microcyn® Technology and MicrocynVS® are trademarks or registered trademarks of Sonoma Pharmaceuticals, Inc. All other trademarks and service marks are the property of their respective owners.